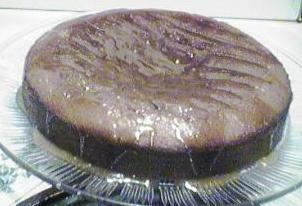 Preheat the oven to 350º F and line the bottom of a 9 x 3 round cake pan. Sift the flour, baking powder, coriander, allspice, salt, cinnamon, and cayenne pepper onto wax paper and set it aside. Combine the milk and vanilla in a bowl. Cream 3/4 cup of butter and add the brown sugar and 1/2 cup of sugar and beat. Drizzle in the eggs, beating after each addition. Add the dry ingredients in 3 additions alternately with the milk mixture. Beat until combined. Finally, add the raisins at the end. Pour it into the pan and bake for 35 to 40 minutes. Cool on wax paper on a wire rack. Combine 2 tablespoons sugar, the honey, and 1 tablespoon of butter in a saucepan and bring to a boil over medium heat. Cook for 3 minutes. Pour on the cake. Smooth with a frosting spatula.